Vegetables are on the menu this week and this balsamic reduction works as well with carrots and green beans as it does with broccolini. Start by heating some olive oil in a large pan over medium heat then saute the broccolini until it starts to brown, about five minutes. Add a quarter cup of water and a bit of salt and continue heating until the water has evaporated. Stir in a couple of chopped garlic cloves followed by a quarter cup of balsamic vinegar…making sure your exhaust fan is on before you do. 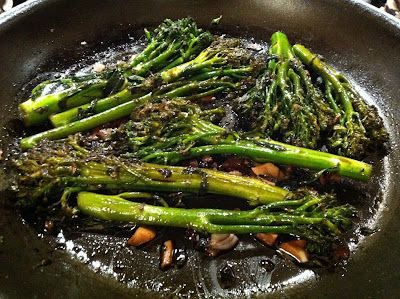 By the time the vinegar has reduced to a glaze the broccolini should be tender, if not add a splash more vinegar, cover, and let cook for a few minutes longer.